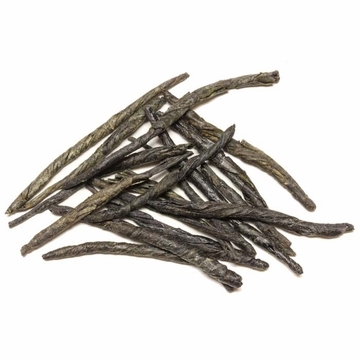 This is a black bitter stalk tea. At one time Ku Ting was used only as an offering to royalty. 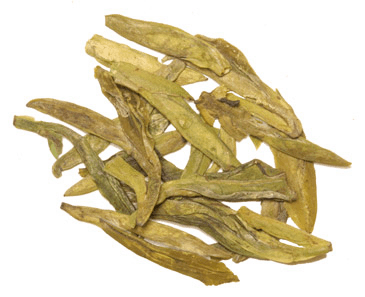 In Chinese medicine this rare and expensive tea is known to be extremely effective for lowering cholesterol and lowering high blood pressure. Researcher found that people who drank this tea daily has a lower chance of getting a stroke or a heart attack. 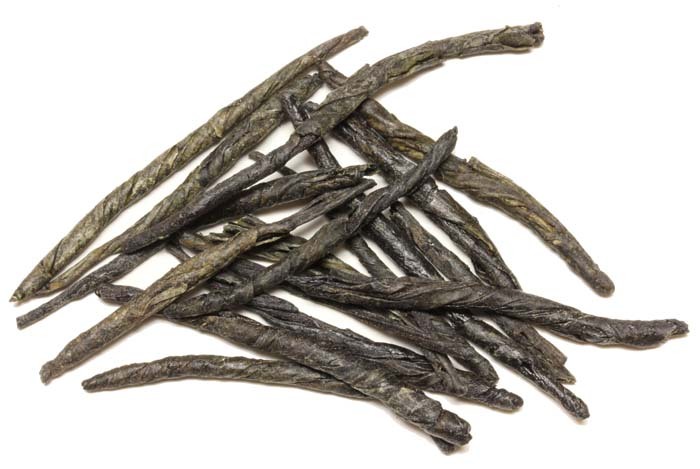 Because this tea is very concentrated, we suggest using one stick of Kuding with every 500ml of water. Love this TEA all day long. Has mild Sweet after taste. Truly a bitter tea but with a sweet aftertaste. Good for you too. Yes, it is bitter but good..Its a clean tasting tea, and leaves no aftertaste like some teas..I would use a teaspoon of honey till I got use to it,,now I could drink it plain and I actually like it now..has many health benefits.. 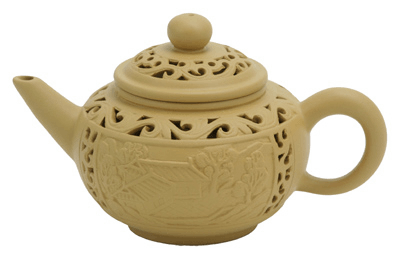 I brew it in my new Calligraphy Yixing Teapot.. I purchased this to help with some health issues. It is bitter but has a sweet finish to it. The bitterness is not overpowering. If it is too bitter for you, consider mixing it with other tea. It is too soon to tell if the health benefits will pan out for me. Very special, very bitter. I steep for about 2-3 minutes at a time using the same leaves for at least three cups of tea. Sharpens my mind and digestion. I like bitter teas and this one has a nice sweet linger to it. This tea is clean and "medicinal" in flavor--a deep bitter herbal flavor. I enjoy drinking it after dinner, as it "feels" very purifying. I use one stick for a small pot of tea. That is all it takes. Light and tasteful... One of my favorites.. This tea is very similar to a tea a good friend brought back from China as it was fresh, strong, and bitter as it is known to be. This tea had all the similar characteristics. I will buy this tea from Enjoying Tea again in the future. I gave it a 4 star rating as I haven't tested their more expensive Kuding tea which I may in the future. Description is correct when it says it has a bitter taste, but is good for you. It was a much stronger bitter than I imagined, but I'll try again. Takes some getting used to. If you are a tea devotee, then you'll adjust to it. I've suffered from chronic duodenal ulcers for years. After I started taking Prilosec I found I couldn't get off of it. My stomach was worse than before, so I kept going back to it. I noticed with the first cup of this tea that my stomach and gut felt better, so I decided to just try this tea and stop the prilosec. It worked! Whenever I felt a twinge I'd take a sip and the discomfort went away, along with all the other attendant gut problems. I drank it very strong, left the leaf in until I was through drinking, but I got to enjoy the bitterness. It seems to have actually healed my digestive tract. Now, I drink a cup or two a day---and I don't need prilosec. So happy. Im a nurse and i have issues with my blood pressure. I have been on Hydrochlorathiazide for some months now. It has been effective to some degree with minimal side effects and insurance made it a little cheaper. I fortunately found this website because i was looking for dragon well tea. When i looked down and saw the healing recipes i took a look. I bumb into the kuding tea. At first it was too good to be true but when i looked it up on wikipedia it was legit but the same for eucommbia bark but that was a waste of money. But since i could chance $20 i said why not. Maaaaan let me tell you DID NOT WASTE MY MONEY this time. I'm sure about how long it last but i take it once a day as instructed. Im sure this $20 supply will last me nothing short of six months to a year. Its a lot. Needless to say i threw away all the other stuff. Haven't been able to monitor my cholesterol but curious to see where thats at too now. My blood pressure have been phenomenal. I had no idea i would see blood pressures this low this fast. Believe me it drops in a matter of minutes. Not sure about some of the other recipes but THIS WORKS. This tea is good when mixed with others, very bitter on it's own. I love this tea. I combine it with aged pu-ehr toucha to make a wonderful, extremely healthy tea. I use one IK "stalk" and one toucha per 40 oz teapot. The IK "stalks" do make the tea bitter but I like it better than straight pu-ehr. This combination is a very good coffee alternative as it makes a very dark brew, has big flavor and bitterness similar to coffee. This tea was given to royalty and used in Chinese medicine. Well, my first impression was that it smelled like medicine. As I dipped a finger and touched it to my tongue... the taste lingered as nothing I had had before. I used exactly one stalk with 500ml and it is the strongest tea I have tasted. It tastes like strong medicine. Now I do not usually put sweetener in tea, but I had to add some stevia. This made it much more palatable. Would I drink this if it weren't good for me, probably not. But as a person who is trying to lower their cholesterol I will press on despite the chemical aftertaste in the back of my throat. Wow that's strong tea.